Our latest completed custom wall aquarium design is this superb 2 metre long tank. 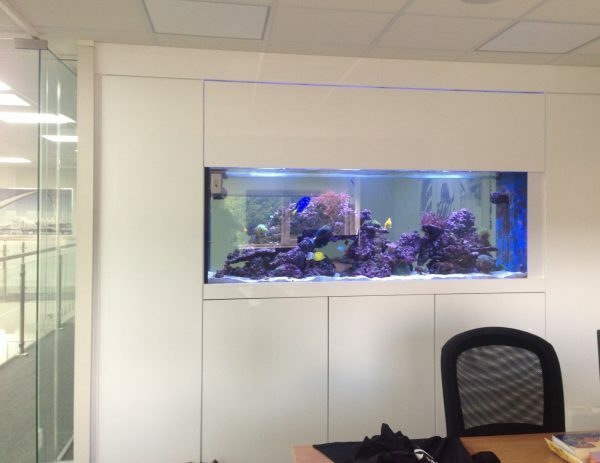 This fish tank installation in Newcastle was a completely bespoke build in a commercial premise’s. This custom tank is housed within a wall that separates the companies meeting room and director’s office. The aquarium has been a big success, impressing all of the companies’ prospective clients! 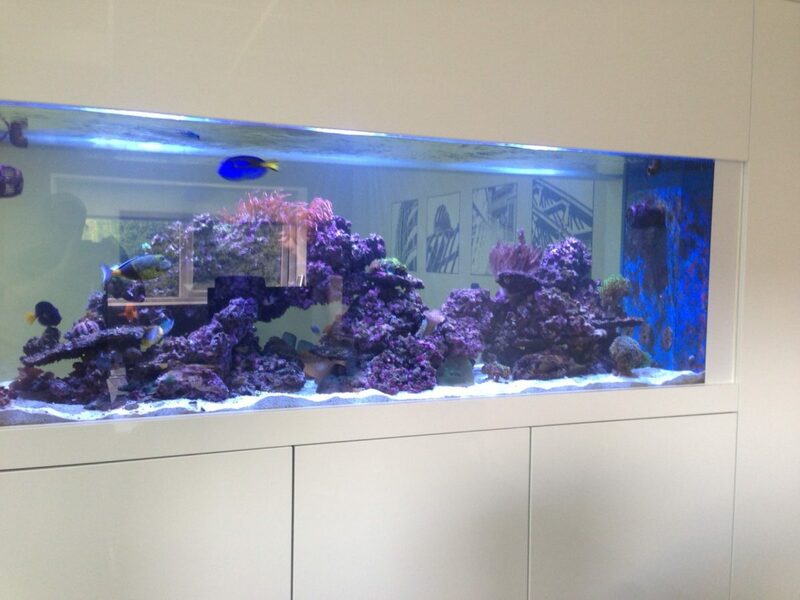 We specialise in bespoke aquariums and are fish tank installers of all types of tanks. To summarize, the aquarium build began with the installation of a metal support frame, sump filter and display tank. We supplied this tank, manufactured in 12mm thick glass with front and rear panes being ultra-clear glass. Next, we added a white sand base and Real Reef Rock aqua-scape. The tank is then filled with saltwater. Once commissioned, the aquarium is left to bed in for a period of one week. Subsequently, we start to add livestock to bring the reef to life. The tank now contains a wide variety of reef fish, live corals and invertebrates such as snails, crabs and shrimp. Lighting is key to any coral reef aquarium, this one is lit via 3 kessil LED lamps. These lamps are linked to a controller which slowly dims the lighting to replicate a natural sunlight period. Furthermore, lighting is timed in accordance with the businesses opening hours. Altogether, the 3 LED lamps combined, give a very realistic shimmer effect. In light of new technologies becoming available, the reef tank is able to automatically replace lost water through evaporation via a pure water filtration unit installed in a utility room. Additionally to our aquarium install service, we have provided an aquarium cleaning service contract. Furthermore, this maintenance agreement is tailored to the client and keeps the aquarium clean and healthy. 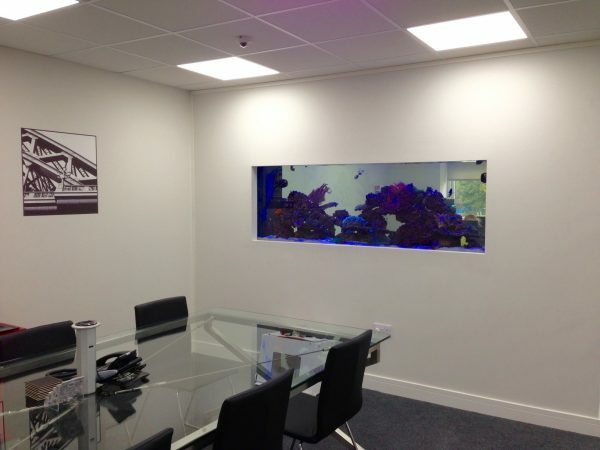 Are you looking for an in wall aquarium design your home or office? Please contact us.